Book launch of 'Carnival' A Photographic and Testimonial History of the Notting Hill Carnival. What inspired you to get ‘Carnival’ produced? The book came about as the result of a campaign to correct the false historical narrative that had been in circulation for many years and to get Rhaune Laslett and the real pioneers of the carnival their deserved recognition for establishing this world renowned event. How did you go about producing it and did you get all the people you wanted involved? We began by researching all the historical articles and documents published about the carnival, spending a considerable amount of time sourcing photographs and interviewing the surviving pioneers of the event. 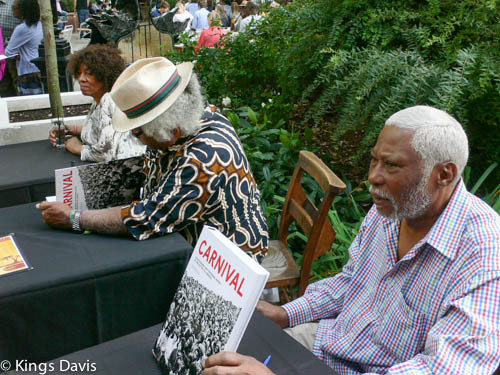 We then established a editorial committee made up people who were instrumental in the development of the carnival and began filtering segments of the story through them as the book was being written. Was it a free flowing process or did you have many challenges? There were many challenges involved, not least the fact that we were deconstructing the established belief that Claudia Jones had started the carnival. This was a false historical narrative and Intellectual fraud that had been validated over the years by many reputable individuals and institutions like the BBC, The Guardian, Evening Standard, Time Out and many of those involved in key positions within the modern carnival. The true genesis of the event had always been known because many of the key pioneers like Hoppy Hopkins, Barbara Shervington, Russ Henderson and Sterling Betancourt are still alive and they are in no doubt as to how the carnival came about and who started it. The reality is that it has always been uncomfortable for many people within the black community to accept that it was a white woman who started the carnival. Many see it as blasphemy to even suggest such a thing but the story is more complex than that – Rhaune Laslett along with community activists in Notting Hill started the carnival as a means of bringing people from different nationalities together, as a direct result of the racism, discrimination and marginalisation that many communities felt at the time. 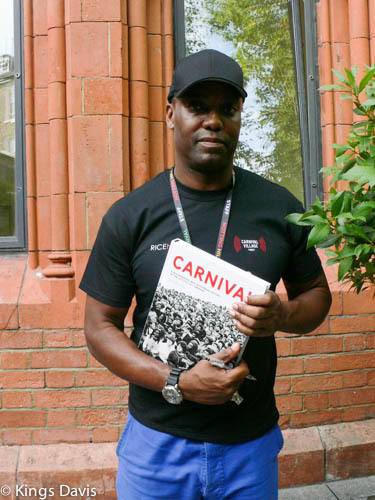 'Carnival' A Photographic and Testimonial History of the Notting Hill Carnival. In order to contest the established history it was important that we produced a book of exceptional quality that could sit on the shelf alongside any other book and be respected and valued for its intellectual, creative and professional output. Achieving this result without the supporting capital necessary was a challenge but we were extremely creative in the ways we went about achieving this. 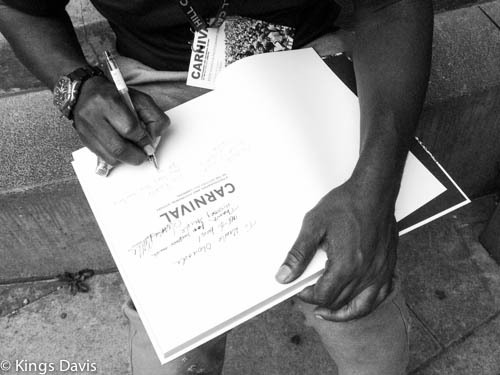 Tell us about the process you went through in launching the book? The launch was a success because the community of Notting Hill and the pioneers who made the event happen took ownership of it. Throughout the production we had an open door policy whereby anyone could walk through our doors at any time and discuss the project, identify characters in photographs or fill in gaps in the story. The launch was hotly anticipated because the audience were involved at every level of the production. This is a beautiful thing because this is exactly how the carnival is produced – so to produce a book that is produced out of the same energy was just sheer magic. What would you do differently on a future one, if there is a future one? I embrace the challenges and mistakes of each production and see them as a part if the process. There is nothing I would do differently, the book has arrived as the energies have delivered it, typos and all. Given that the book is now in the public domain, no doubt more photographs and memorabilia will surface that we would have liked to publish – but such things are beyond our control. The launch was a memorable occasion – what did it feel like to finally launch it and see people’s reaction to it? It was a relief to finally see the hard work pay off and to hold a physical copy of the book. I’m an avid people watcher and it was a great pleasure to see how the public reacted to the book at the launch and the excitement it caused amongst those who lived the story and recognised many of the faces and characters featured. The pioneers, contributors and myself were subsequently mobbed as people raced about and joined long queues to get their books signed. Over 1000 people attended the book launch which is fantastic for any book. We sold almost £7,000 worth of books on the launch night alone which is quite an achievement and this will go a long way in helping to cover our printing costs. It is currently Black History Month and I often take part in discussions on whether a month is really enough to celebrate such rich history. I recently heard a suggestion that it should be moved to August to coincide with the Notting Hill Carnival – what are your thoughts on this? I think black history month has become quite stagnant over the years. We have failed to coordinate a type of national curriculum that would help bring some focus to the event and establish an annual theme or uniformity. We need to be doing more than just pasting up the same posters of the same black icons each year. We need to be more adventurous and expose the achievements of those great icons of African history both past and present and elevate the the debates surrounding the present black experience. This is something that should be a part of our daily responsibility not something that we half heartedly celebrate for one month of the year. Do you think the younger generation are really aware of the true history of Carnival and how can we educate them? 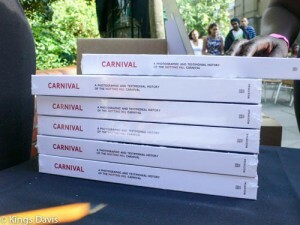 I don’t think many people were informed about the true history of the carnival and it was for this reason that the book was produced. Carnival: A Photographic and Testimonial History of the Notting Hill Carnival, is a very important document that goes a long way in correcting the historical fallacies and establishing a coherent timeline to the event. Finally how is the book selling and will further copies be printed to meet demand? The book has been selling very well and we are almost out of print. At this stage I don’t believe we will be reprinting the book. When we are down to the last 200 copies these will be reserved for academic institutions and libraries as we believe that it is important that the book is available and accessible for future generations who wish to research and investigate the history of the event. We have a fully signed up copy of the book that was signed by all the contributors, people such as Russ Henderson, Sterling Betancourt, Hoppy Hopkins, Leslie Palmer, Darcus Howe, Mike Laslett, Claire holder, Margaret Busby, myself and many others. We received a bid of £1000 to buy the copy and a couple of days ago that bid was surpassed but we are waiting to determine the size of that bid. Such contributions have helped us to cover the immense costs that were incurred in producing this book and has also contributed in making this book a collectors edition that will no doubt be sought after for many years. ‘Chasing Visual Play’ with Martha Cooper in London.